Amelia Island is the ultimate travel destination when looking to get away. It’s pristine nature and beautiful beaches make it a perfect spot to spend some time in the outdoors. You will never go bored here in Amelia Island as there is something to do for everyone. Experience this world class destination along with its incredible outdoor fishing adventures. Enjoy an Amelia Island fishing charter next time visiting Florida. Amelia Island is part of the Sea Islands chain of barrier islands located on the north east coast of Florida. It has a dense history of exploration and discovery. If you are looking for your next place to explore, this is most certainly one you can get lost in. The holiday’s are coming up and this is the perfect destination to adventure to. Whether you enjoy luxury resorts, golf courses or numerous sandy beaches, you can have it all. Don’t miss out on a fishing charter near shore or offshore while you are here. Family activities are essential when visiting Florida. Amelia Island offers exceptional family water activities that can truly enhance your experience here. 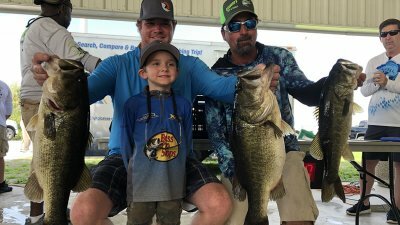 Saltwater fishing is a great way to get your family in the outdoors as well as bond with them like you haven’t before. Take a break from the beautiful resorts, sandy beaches and hitting the golf balls and hop on board with our local experts. Our local experts have explored and uncovered all the waters possible in Amelia Island. 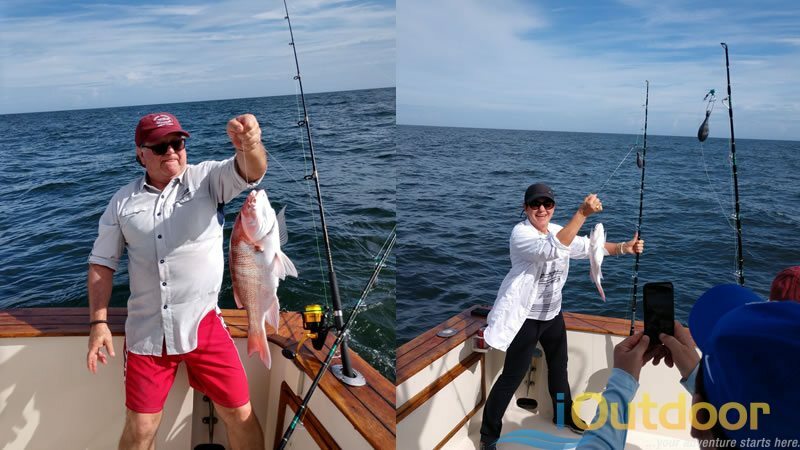 When you adventure out Amelia Island offshore fishing, you can count that you are going to have the best experience possible. Our captains have been fishing the area for over 35 years and have caught every saltwater species in the area. Captain Scott Thompson is a local fishing expert that will put you on fish and enrich you with years of knowledge of Amelia Island. Captain Scott had the pleasure of fishing with a wonderful family this month. Amauri, his brother Marcos, his son Marcos and his son Marco along with two young ladies came out to explore what offshore fishing had to offer. They were traveling from Brazil to spend some time at this beautiful destination. While here, they had to get out in the deep blue sea. 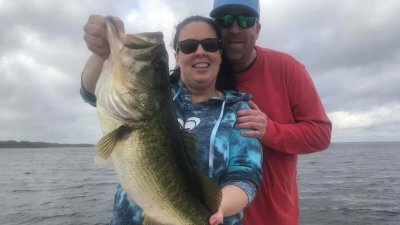 They adventured out on a two day fishing charter out of Amelia Island. The weather conditions were great on both days. Sea conditions were not as great on the first day creating an opportunity to fish closer to shore. While fishing there, they caught several species of fish. The main catch was migrating and spawning Redfish. 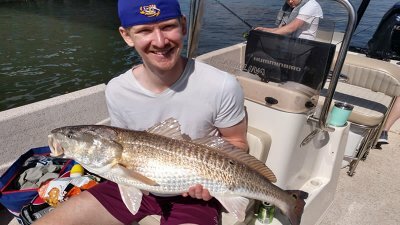 Most of the catches of redfish weighed in at 20-50 pounds. Sea conditions laid down and allowed them to go offshore the second day. Bottom fishing was what they wanted to do while offshore fishing. Captain Scott took them 25 miles offshore to one of his productive bottom fishing spots. After several drops, they started hooking into big red snapper. Cut bait was the magic on this fishing trip. This awesome group got to experience many different catches. They had a grouper on as well but you have to know how to fish for them. When grouper get hooked into, they want to run and dig into the rocks. Once this happens, you are most likely going to lose the fish. Some additional species caught were sea bass. Sea bass can be caught on the bottom as well. Interesting enough, the reef they were fishing also was holding barracuda. This group really enjoyed landing a 5 foot barracuda. 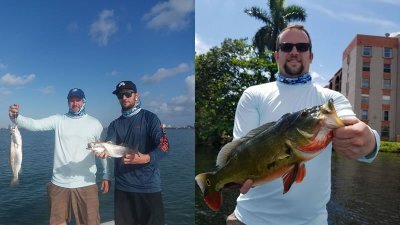 Captain Scott really enjoyed fishing with these clients. It is always nice to be able to share something you love with travelers and visitors. Captain Scott holds Amelia Island close to his heart and would love to show you what is so magical about this destination. He looks forward to seeing you on the water next time. Amelia Island is the perfect location to spend time in the outdoors. 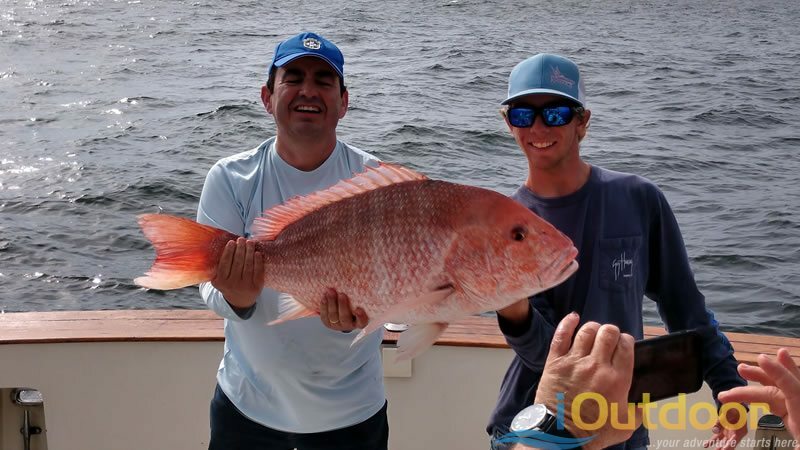 Whether it is inshore or offshore fishing, you can have a great time with your family or friends. Take a break from the beautiful beaches and resorts and hop on board for what could be the adventure of your lifetime! Let’s get you hooked up and we are looking forward to getting you out on the water.